The city of Gallatin was developed on part of the original North Carolina land grant #1 awarded to Captain James Trousdale, Governor William Trousdale’s father, for his service in the Revolutionary War. In 1812, lots were sold for the construction of the jail, courthouse and other Gallatin city buildings. The Trousdales had 7 children with 5 reaching adulthood. They were: Maria Louisa (Benjamin F. Allen), Valeria (General James Lafferty), Charles (Eleanor Katherine Odum), Julius A. (Annie Berry), and Frances (John Bell Peyton). William Trousdale died at Trousdale Place in 1872, and his wife, Mary Ann Bugg Trousdale, continued to live there until her death a decade later, when the home passed to their son, Julius. After the death of Julius Trousdale, Annie Berry Trousdale deeded the home to the Clark Chapter #13 of the United Daughters of the Confederacy® to honor all veterans and in particular, veterans of the Confederacy. 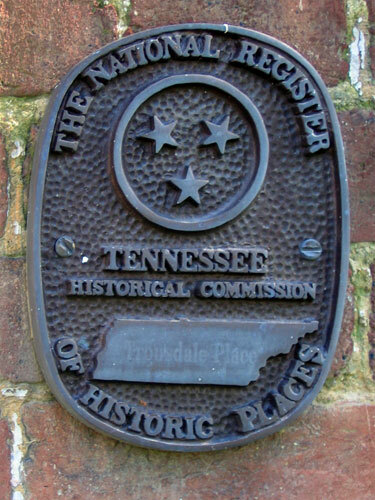 The home became known as The Trousdale Place. © Trousdale Place. All rights reserved.